On the eve of its MAX developer conference, Adobe announced that the next version of the Flash Player, 10.1, will run on smartphones as well as PC and Mac when it comes out in the first half of next year. 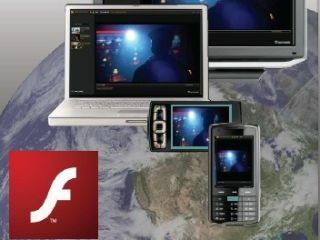 This is the first time we'll get the same version of Flash on mobile and PC systems rather than the cut-down Flash Lite for phones, and it's the first time you'll be able to download Flash onto your phone yourself rather than having to hope the OS or handset has it bundled. And having Flash on mobiles is the first step towards having AIR apps running natively on phones. Flash Player 10.1 won't run on every smartphone OS. According to Tom Barclay, Flash senior product marketing manager, the list includes "Symbian Series 60, Android, Windows Mobile, Palm webOS and hopefully others we will be able to talk about in the near future". A developer beta for Windows Mobile 6.5 and Palm webOS (and for Mac and PC) will be available before the end of the year and the public betas for Android and Symbian are expected early in 2010. The final version of 10.1 will ship in the first half of 2010 and Barclay says that "there will be devices in the market that support it next year". If the Flash player doesn't come on a new device or as part of a system software update, it will be available through app stores; or if you try to load Flash content, Barclay says you might get an automatic download. "Our goal is to make it very easy to install and keep it updated to avoid fragmentation of the runtime," says Barclay. As well as working with Adobe on the Android Flash player, Google is also signing up to the Open Screen project that Adobe announced earlier this year. While Google hasn't made any public announcements about Flash and Chrome, group Flash product marketing manager Adrian Ludwig says that "their participation is a strong indication that they're planning on delivering a Flash player and AIR to their operating system". That might seem odd in light of the fact that Chrome product manager Ian Fette hinted (during Google's own developer conference this year) that he was hoping to see more video on the web move away from Flash into codecs supported by its proposed HTML 5 video tag: "We have to support something like 50 image formats in the browser -- it's just too complicated; for video, we want to make it simpler." But with 75 per cent of videos on the web currently in Flash format, Ludwig says Google is being pragmatic about supporting the platform: "They consider a Flash player one of the technologies that's very important for them to be successful in building web technologies." The obvious issue with Flash on mobiles is whether the processor is powerful enough to show content. Tom Barclay claims "a lot of existing content will just work on those devices", while the new player takes advantage of hardware graphics acceleration and video decoding. With other improvements in the code, he promises the new player increases software rendering performance by "over 87 per cent" and reduces memory consumption by "over 55 per cent". Adobe has worked on specific optimisation for devices based on Qualcomm's Snapdragon chips (which means high-end phones like the Toshiba TG01 and the promised SmartBook devices), as well as for Nvidia's Tegra and Ion chips. Buy one of the new netbooks like the HP Mini 311, Lenovo Ideapad S12 or Samsung N510 and you'll be able to try a public beta of Flash 10.1 that will show full-frame H264 video by the end of this year.